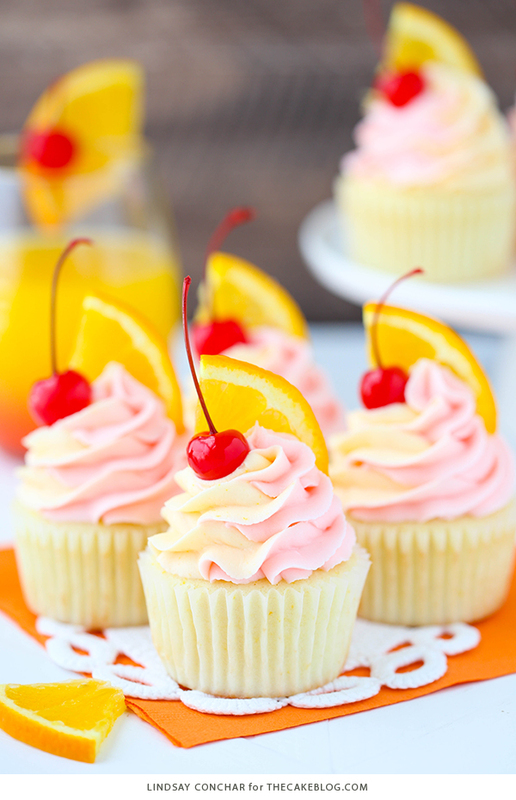 Tequila Sunrise Cupcakes. 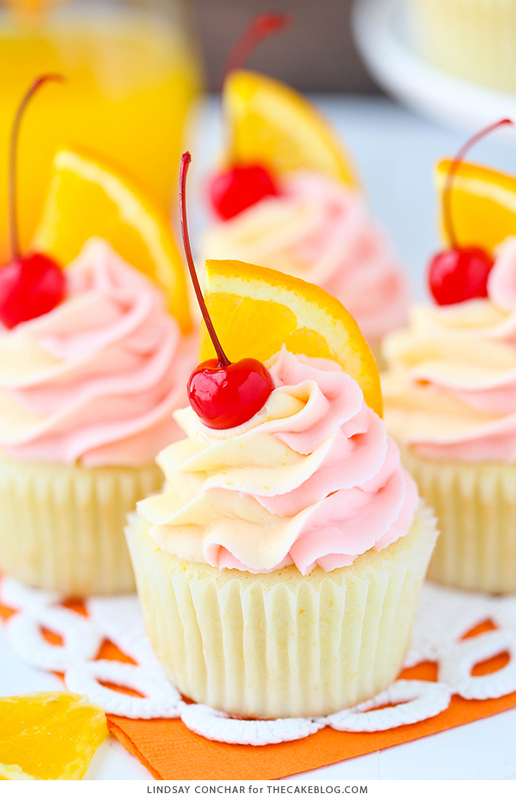 A cupcake recipe inspired by the cocktail with orange juice, grenadine and tequila decorated with two-tone frosting and maraschino cherry. A new recipe by our contributor, Lindsay Conchar. 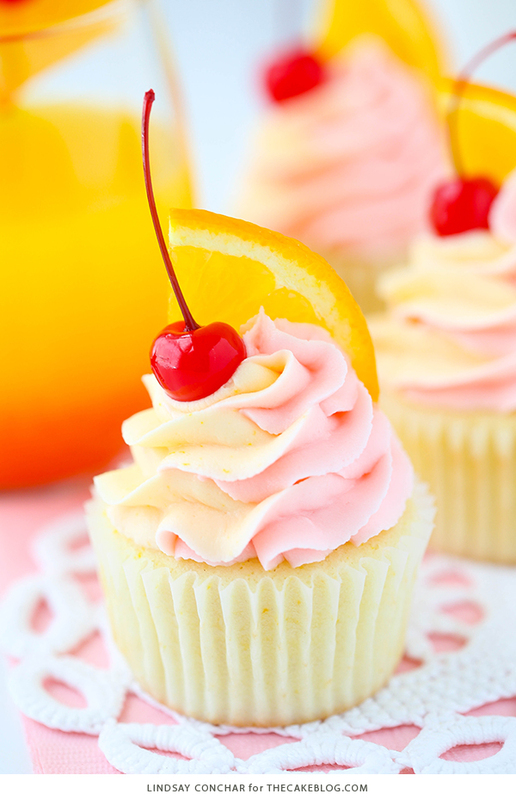 These cupcakes are light, fluffy and fun version of the classic cocktail. 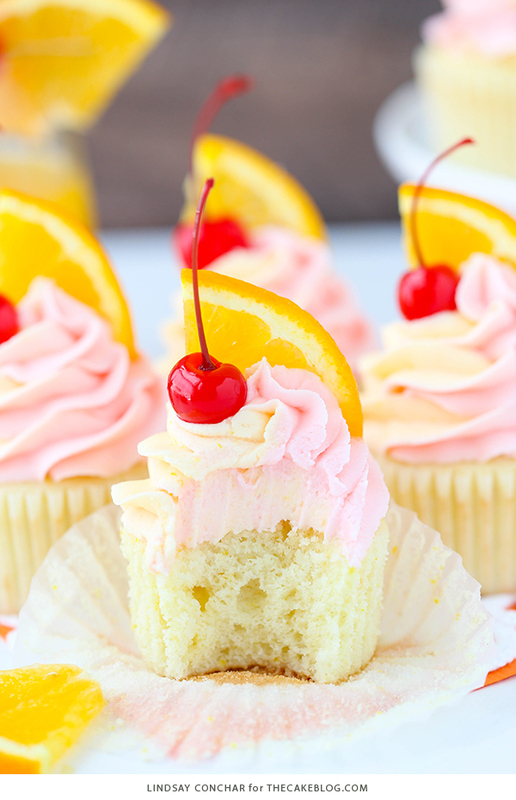 The cupcake is flavored with fresh squeezed orange juice and orange zest which gives it the most wonderful citrusy orange flavor. I chose not to color the batter, but feel free to add a little orange coloring if you’d like. I also added a bit of tequila to both the cupcake and the frosting. 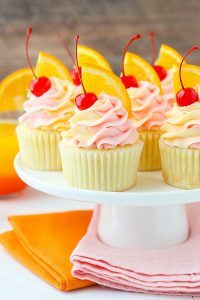 The frosting is a combination of both orange and cherry buttercreams swirled together for a fun multi-colored cupcake. 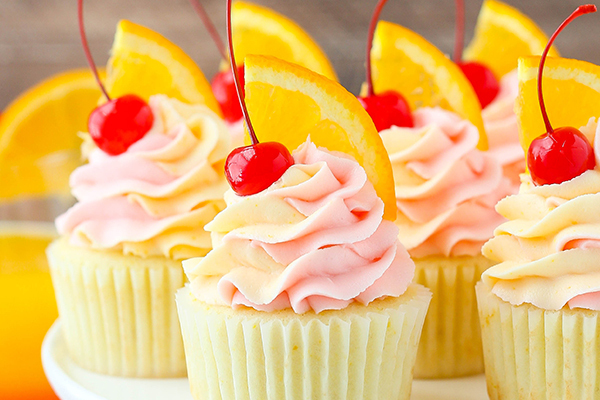 The orange frosting has a little bit of fresh squeezed orange juice and orange zest, and the cherry frosting is flavored with grenadine. I added a touch of orange icing color to the orange frosting, but the pink shade of the cherry frosting is all from the grenadine. Feel free to add more color to the frosting if you want a bolder swirl. I added the frosting to two separate, smaller piping bags, then put both of those bags into a large piping bag fitted with a large closed star tip. The two bags combined into one does a great job of keeping the colors from combining before being piped onto the cupcakes. 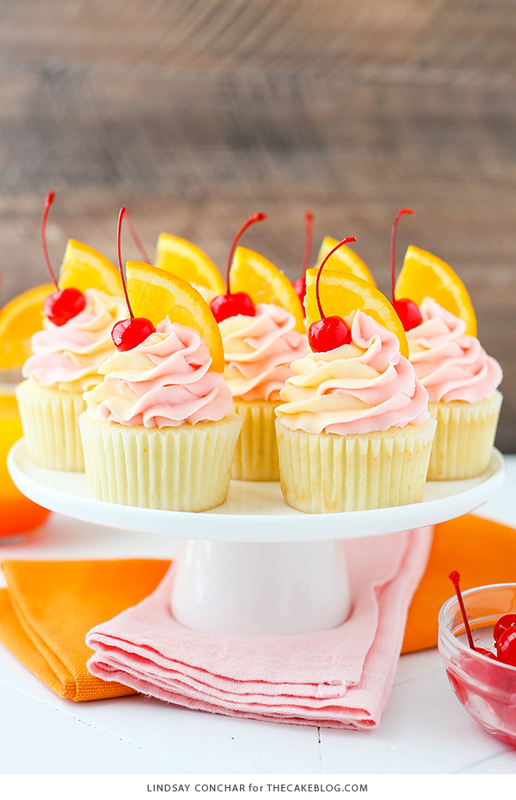 The cupcakes are topped with a cherry and slice of orange, to give the full cocktail effect! They make a really fun presentation and feel like summer in a cupcake. They are light and delicious and make me feel like I should be sipping my tequila sunrise cocktail and eating a cupcake right by the pool. 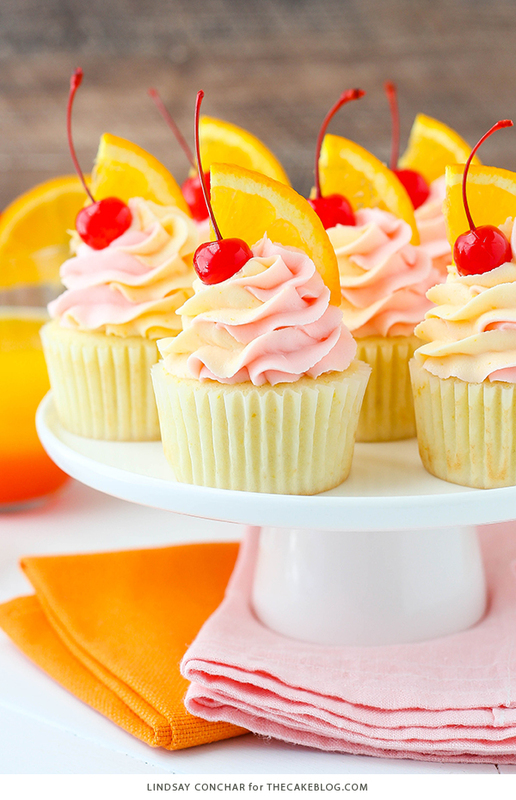 Tequila Sunrise Cupcakes. 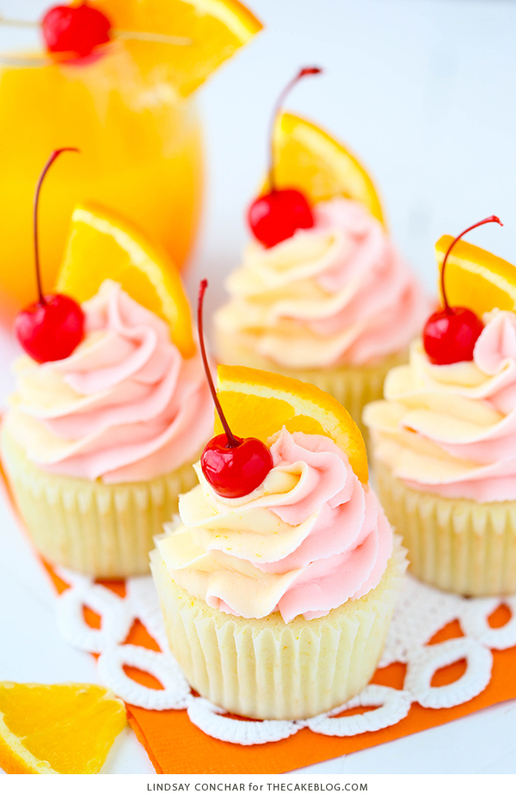 A cupcake recipe inspired by the cocktail with orange juice, grenadine and tequila decorated with two-tone frosting and maraschino cherry. Preheat oven to 350°F (176°C) and prepare a cupcake pan with cupcake liners. In a large mixing bowl, cream butter and sugar together until light in color and fluffy, about 3-4 minutes. Add sour cream, vanilla extract and orange zest and mix until well combined. Add egg whites in two batches, mixing until well combined after each. Scrape down the sides of the bowl as needed to be sure all ingredients are well incorporated. Combine dry ingredients in a separate bowl, then combine the orange juice, tequila and milk in a small measuring cup. Add half of the dry ingredients to the batter and mix until well combined. Add the orange juice mixture and mix until well combined. Add remaining dry ingredients and mix until well combined. Scrape down the sides of the bowl as needed to be sure all ingredients are well incorporated. Fill the cupcake liners about halfway. Bake for 15-17 minutes, or until a toothpick inserted comes out with a few crumbs. Beat the butter and shortening together until combined and smooth. Add about half of the powdered sugar and mix until smooth. Add the tequila and mix until smooth. Add the remaining powdered sugar and mix until smooth. Divide the frosting in half. Add the orange zest and juice to one half and the grenadine to the other. Add some orange icing color to the orange frosting, if desired. Put each of the two frostings into two piping bags, then place both piping bags into one larger bag fitted with a large closed star tip (I used Ateco 844). 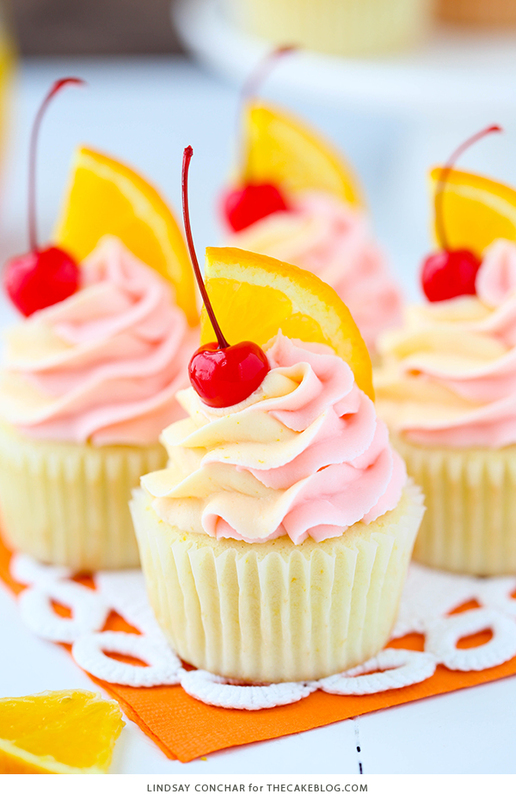 Pipe swirls of frosting on top of each cupcake, then top them with a cherry and quarter slice of orange. If you prefer an all butter frosting, simply substitute the ½ cup of shortening with ½ cup of butter (totaling 1 ¼ cups of butter for the frosting). Store cupcakes in the refrigerator. Serve at room temperature. Lindsay is the recipe developer and photographer behind the blog Life, Love and Sugar. She has a special love of cakes, but will gladly sample any sweet treat. She is a lover of all things pink and collector of beautiful cake stands. Your cupcake liners look so great, not greasy! Which ones do you use? Do you mind sharing? Thank you. These look absolutely gorgeous and delicious by the way! Yes, in my opinion, the orange juice definitely puts these into the healthy category ! I love how you did the frosting…very clever! Fantastic recipe and photos! Nice recipe, I love this. These look delish! Hope mine turn out just as amazing. ☺ Beautiful photos! This was SUCH a yummy recipe! I turned this into a layer cake and topped it with a white chocolate ganache and an isomalt sail for my blog, Bakes and Blunders (https://www.bakesandblunders.com/tequila-sunrise-cake-with-an-isomalt-sail/). It has such a wonderful flavor and the frosting is just so beautiful to look at. Thanks for sharing such a delicious recipe.